It’s your lucky day as an Emperor has chosen you to visit his stunning residence to spend time with each of his four beautiful daughters so that you can get to know them and ultimately decide which one you’d like to marry – with the Emperor prepared to offer very large rewards of up to 40,000 coins to see one of them married off! While the graphics appear dated compared to the latest video slots, you’ll find yourself staying at the Emperor’s residence strolling around his perfectly maintained gardens taking in breath-taking views of the moon shining down as you take turns getting to know each of his four daughters. The Emperor has also ensured that authentic oriental music is played in the background to create a romantic ambience and give you a taste of the continent during your stay. 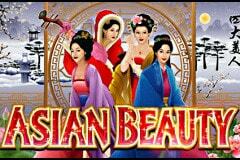 The Asian Beauty slot machine has been developed by Microgaming and it is another of their 5-reeled slots offering 243-ways to win. While the Emperor is happy to cover your costs when you touch down, you’ll first have to stump up between 30p and £300 for plane tickets to these beautiful lands but it’s well worth it as you’ll unlock jewellery boxes to enjoy a free spins feature and you will also enjoy a pick me bonus game where the aim is to match a trio of the beauties – could she be the one? The charm of China flows out of the Asian Beauty slot machine with some stunning symbols featuring on the reels, but none of them are as impressive as the bevy of beauties you’ll be getting to know. The four Emperor’s daughters all appear dressed elegantly in embroidered dresses to impress and offer the same payouts with up to 200 coins on offer for matching the same daughter on a single line, however they are far from being the most valuable symbols you’ll encounter during your stay. It’s the Asian Beauty logo which is the Wild symbol that you’ll hope to view most as this brings rewards of up to 2,000 coins for five on a line and it can substitute for all but the Scatter symbol, which is represented by an ornate jewellery box and this is key to spinning the reels for free. During your stay at the Emperor’s residence you will also see two types of stunning flowers which he proudly grows in his garden, plus there are gold and silver bowls which you are served food in – let’s hope the sushi is as delicious as the wins on offer on these reels! The Emperor may thank you for spending time with his gorgeous daughters by gifting you jewellery boxes full of cash as a token of appreciation, but it will be a boxes filled with free spins should you see three or more of them on the reels at the same time. The number of free spins will depend on the number of jewellery boxes he gives you with three bringing you 5x your stake and 10 free spins, four resulting in 15x your stake and 15 free spins, while the maximum of five means he has really taken a shine to you as he lavishes you with 100x your stake along with 25 free spins. As if that wasn’t impressive enough, the feature can also be retriggered and any wins you reap from your free spins will be doubled in value – it looks like he’s desperate to get rid of one of his daughters! There is also a pick me bonus game which is titled the Asian Beauty Mirror Bonus and this offers rewards of up to 9,000 coins. This is a feature which occurs completely at random rather than requiring a specific combination of symbols and whenever you get lucky enough to be summoned to the Emperor’s realm at the end of your trip you’ll be faced with 12 mirrors with the aim being to click on them at random until you match three of the same beauty in order to win the cash prize associated with her which is published to the side of the reels. Microgaming bring a touch of class to the reels with this oriental encounter which is full of opportunities to cash in on the Emperor’s desire to see one of his four daughters get married. These beauties aren’t for any old scruff though, so fix up and look sharp before you jet off to the Emperor’s residence!